In the BBC’s crime drama series Sherlock (a modern take on the classic Victorian-era stories of Sir Arthur Conan Doyle), viewers see Benedict Cumberbatch’s character Sherlock Holmes use a remarkable mnemonic technique to recall obscure facts key to solving crimes. He calls it his “mind palace.” Just as great consulting detectives can use this technique to best criminals, students might use it to help master course material. And, if employed referencing some ubiquitous campus edifice (like a dining hall), instructors can assist students in furnishing the rooms in their mind’s eye. The concept of the mind palace (a.k.a. the “method of loci” or the “memory palace”) is actually quite old. Many credit English historian Dame Frances Amelia Yates for reviving the classical concept in modern times. In her 1966 book The Art of Memory (reprinted in 1999), Yates related the mythic origin of the technique as told by the Roman philosopher Cicero. At a grand banquet, the renowned Greek poet named Simonides of Ceos chanted a lyric poem that, while praising the banquet’s host, also devoted much verse to praising the demigods Castor and Pollux. The host declared he would only pay Simonides half his commission since the poem only half dealt with him. The other half, the host chided, Simonides could collect from the two demigods. Later that night, Simonides received a message that two young men wished to see him. He stepped outside the diners’ hall to meet the men, but found his callers had vanished. As Simonides stood perplexed in the host’s garden, a calamitous crash came from the hall. The entire building had collapsed, killing all inside. While, presumably, apparitions of Castor and Pollux had repaid Simonides for his praise by bringing him to safety, the wreckage mangled the other banquet-goers beyond all recognition. Simonides, however, helped mourners filled with questions about loved ones by carefully recalling exactly where every diner had been seated in the hall so that their bodies could be retrieved and taken for burial in family plots. Simonides extrapolated from this experience that anyone desiring to hone memory “must select places and form mental images of the things they wish to remember and store those images in the places so that the order of the places will preserve the order of things” (Yates, 1999, p. 2). The origin story of the memory palace is good fiction. Yet, the technique’s usefulness is a fact validated by much modern research (e.g., Qureshi et al., 2014; Legge et al., 2012; Amiryousefi and Ketabi, 2011; Heinrichs & Nager, 2009; Hodges, 1982). Scholarship has shown that material in virtually any academic discipline can be learned when housed in one’s memory palace. Some of my experiences at UNG illustrate and add credence to this notion. Among other things, academics in my discipline (political science) aim to equip students we encounter with knowledge to become highly engaged and effective citizen/stewards of American government. A component of this includes teaching students about civil liberties. In large part, this entails learning about the Bill of Rights in the U.S. Constitution and a raft of court cases that, essentially, further qualify the language of each of these first ten amendments. Many students grasp this material just fine through what might be termed more “conventional” studies (i.e., from reading textbook chapters, taking and then reviewing many times class notes, etc.). Other students struggle. 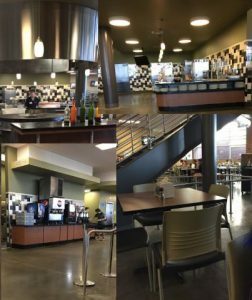 I have assisted some in learning by guiding them to render a mental construct of the Dahlonega campus “Chow Hall” (as the Dining Hall is affectionately known) as their mind palace and to then place therein imagery about civil liberties. In mentally furnishing their palace, from early-on and where possible, I encourage students to proceed sequentially just as Simonides suggested. So, pertaining to the civil liberties unit, since the cashier’s desk where workers swipe students’ ID cards is what one first encounters upon entering the dining hall, I encourage students struggling with learning to associate aspects of the Constitution’s First Amendment with this. I might then suggest the student mentally house images of things related to the Second Amendment around the Chow Hall’s soup & salad bar since convention (outside of France anyway…) places these courses first in a meal. I would then encourage students to continue making mental images about the material under study at the various stations within the Chow Hall in roughly the same order the student would visit them during an actual meal. Because the Dining Hall houses so many fixtures and places (e.g., elevators, restrooms, drink & ice cream dispensers, a tray bussing area, various lunch lines, etc. ), there are many locations where students may mentally hang imagery. It has been my experience that even a robust unit’s material may generally be mentally dispersed throughout the Chow Hall with relative ease, so ample is the facility. My experience has also taught me something about the character of the imagery students utilize in furnishing their mind palaces. I will defer to my colleagues in the Department of Psychological Science to explain fully how memory works; I am unqualified to do so. What I will note, though, is that rather banal imagery does not seem to best promote recall. Rather, images that are garish, even grisly, or otherwise outlandish are what most readily trigger recall. For instance, if a student were to simply visualize a copy of the constitution sitting atop the salad bar with the Second Amendment circled, it might register. However, if the student were to visualize the salad bar stocked not with salad but rather with bins full of, say, severed Grizzly Bear appendages, this would almost certainly bring to mind the right to “bear arms” discussed in the Second Amendment. The student could add further nuance to this. Were she to visualize Ronald McDonald wearing a Chicago Bulls jersey filling his plate at the salad bar, the student would likely be prompted to recall the court case of McDonald v. City of Chicago, 561 U.S. 742 (2010), in which the Supreme Court ruled that the Second Amendment would be incorporated against state and local governments. While it might take a bit of time for some students to create vivid (even farcical) imagery like this and relate it to features in the Chow Hall, the payoff (in my experience) is enhanced recall. Surely, material in other disciplines will, like civil liberties in Political Science, be ripe for study in this manner. Tasks such as committing to memory Weber’s characteristics of bureaucracy in Sociology 1101 or learning the steps of the scientific method in Introductory Biology, for example, could be made easier for using the method of loci. Moreover, if both students and educators visualize some particular palatial floor plan that they have knowledge of in common (like the Chow Hall), instructors can better guide students from imaginative place to place, helping them to commit material to memory sequentially along this path. Once students remember something, understanding and appreciation can follow. Hence, just as it was in the time of Simonides, a dining hall—of all things—may play a key role in bettering memory and, in turn, answering questions that very much need to be answered. Amiryousefi, Mohammad and Ketabi, Saeed. (2011). Mnemonic instruction: A way to boost vocabulary, learning and recall. Journal of Language Teaching and Research, 2(1), 178-182. Heinrichs, Micky and Nager, Alan L. (2009). More clever and useful mnemonics. Contemporary Pediatrics, 26 (8), 38-43. Hodges, Daniel L. (1982). A teacher’s guide to memory techniques. Focus on Productivity, 7, 23-27. Legge, Eric L. G. et al. (2012). Building a memory palace in minutes: Equivalent memory performance using virtual versus conventional environments with the Method of Loci. Acta Psychologica, 141 (3), 380-390. Qureshi, Ayisha et al. (2014). The method of loci as a mnemonic device to facilitate learning in endocrinology leads to improvement in student performance as measured by assessments. Advances in Physiology Education, 38 (2), 140-144. Yates, Francis. (1999). Selected Works, Volume III: The Art of Memory. London, UK: Routledge.